MCOF will hold a public Star Party Friday evening December 30, 2005 at 7:30 PM on the observatory grounds at Greenwood Elementary School. Planet Mars will be overhead. Venus in the west in the very early evening sky. Also, the Andromeda Galaxy will be visable. Everyone is invited to come out and view the wonders of the night sky through the many wonderful telescopes available with the experts from the Foundation to guide you. If you have a telescope or binoculars, you may bring it and get help on using it to view the heavens. Refreshments will be served. Member benefits include: quarterly newsletter, yearly calendar, voting rights at MCOF general meeting, admission to 'Members Only' events and notification of all events. All donations of $50 or more will be memorialized on Founding Members' plaques to be displayed inside the Observatory. The next 'Members Only' night will be held Friday December 23, 2005 at 7:30 PM at the observatory. If you are not a member, you may obtain membership there for $20/individual or $35/family. Come out and enjoy the dark skies of Morgan County while learning more about Astronomy and the Stars. Other upcoming events at the observatory include an Indoor Summer Star Show at the Ice House Saturday (Date to be announced) (topic to be announced) and a Public Star Party October 7, 2005 at 7:30PM. MCOF will hold a public Star Party Friday evening December 2, 2005 at 7:30 PM on the observatory grounds at Greenwood Elementary School. Planet Mars will be rising in the east. Venus in the west in the early evening sky. Also, the Andromeda Galaxy will be visable and The Summer Triangle (Asterism) will be overhead with the Ring Nebulae. Everyone is invited to come out and view the wonders of the night sky through the many wonderful telescopes available with the experts from the Foundation to guide you. If you have a telescope or binoculars, you may bring it and get help on using it to view the heavens. Refreshments will be served. Member benefits include: quarterly newsletter, yearly calendar, voting rights at MCOF general meeting, admission to 'Members Only' events and notification of all events. All donations of $50 or more will be memorialized on Founding Members' plaques to be displayed inside the Observatory. The next 'Members Only' night will be held Friday Sept. 30, 2005 at 7:30 PM at the observatory. If you are not a member, you may obtain membership there for $20/individual or $35/family. MCOF will hold a public Star Party Friday evening November 4, 2005 at 7:30 PM on the observatory grounds at Greenwood Elementary School. Open House on October 8, 2005 at 7:30 pm. on the observatory grounds at Greenwood Elementary School. Planet Mars will be rising in the east. Also, the Andromeda Galaxy will be visable and The Summer Triangle (Asterism) will be overhead with the Ring Nebulae. Everyone is invited to come out and view the wonders of the night sky through the many wonderful telescopes available with the experts from the Foundation to guide you. If you have a telescope or binoculars, you may bring it and get help on using it to view the heavens. Refreshments will be served. MCOF will hold a public Star Party Friday evening October 7, 2005 at 7:30 PM on the observatory grounds at Greenwood Elementary School. Open House on October 8, 2005 at 7:30 pm. on the observatory grounds at Greenwood Elementary School. Planet Mars will be rising in the east. Also, the Andromeda Galaxy will be visable and The Summer Triangle (Asterism) will be overhead with the Ring Nebulae. Everyone is invited to come out and view the wonders of the night sky through the many wonderful telescopes available with the experts from the Foundation to guide you. If you have a telescope or binoculars, you may bring it and get help on using it to view the heavens. Refreshments will be served. MCOF will hold a public Star Party Friday evening October 7, 2005 at 7:30 PM on the observatory grounds at Greenwood Elementary School. Planet Mars will be rising in the east. Also, the Andromeda Galaxy will be visable and The Summer Triangle (Asterism) will be overhead with the Ring Nebulae. Everyone is invited to come out and view the wonders of the night sky through the many wonderful telescopes available with the experts from the Foundation to guide you. If you have a telescope or binoculars, you may bring it and get help on using it to view the heavens. Refreshments will be served. MCOF will hold a public Star Party Friday evening Sept. 9, 2005 at 8:00 PM on the observatory grounds at Greenwood School. The planet Jupiter will be visible in the west and Mars will be rising in the east. Also, The Summer triangle will be overhead with the Ring Nebulae. Everyone is invited to come out and view the wonders of the night sky through the many wonderful telescopes available with the experts from the Foundation to guide you. If you have a telescope or binoculars, you may bring it and get help on using it to view the heavens. Refreshments will be served. Member benefits include: quarterly newsletter, yearly calendar, voting rights at MCOF general meeting, admission to 'Members Only' events and notification of all events. All donations of $50 or more will be memorialized on Founding Members' plaques to be displayed inside the Observatory. The next 'Members Only' night will be held Friday Sept. 2, 2005 at 8:00 PM at the observatory. If you are not a member, you may obtain membership there for $20/individual or $35/family. Come out and enjoy the dark skies of Morgan County while learning more about astronomy and the stars. Other upcoming events at the observatory include an Indoor Summer Star Show at the Ice House Saturday (Date to be announced) (topic to be announced) and a Public Star Party Sept. 9, 2005 at 8:00PM. To get to Greenwood from Berkeley Springs, follow Rt 522 South 2 miles and take a left on Winchester Grade Rd (Rt 13), then travel 9 miles and park at the school on the left. For information 304-258-1013, http://www.nitesky.org, or dynsol@crosslink.net. Astronomy and Science media Links of Interest - Updated July 31, 2005 - Check them out. The MCOF Public Star Party will be held on Friday July 29, 2005 and Friday Aug. 5, 2005 at 8:30 pm. at the Morgan County Observatory. Also, on July 30, 2005 will be an open house after the Morgan County Fair ends. There will be stargazing, refreshments, movies and hands on astronomy exhibits to entertain folks of all ages. From Berkeley Springs, follow Rt 522 South 2 miles and take a left on Winchester Grade Rd (Rt 13), then travel 9 miles. The Greenwood Elementary School will be on the left. Go past and then park at the Observatory Parking lot next to the Observatory. Have a Private Star Party with your friends. See the "Get Involved web page for membership levels for this or contact Kevin Boles at 304 258-1013 for information on pricing for Number of persons attending/# of hours use/trained operator to run telescope. MCOF will hold a public Star Party Friday evening July 29, Saturday evening July 30 and Friday evening Aug. 5, 2005 at 8:30 PM on the observatory grounds at Greenwood School. The planet Jupiter will be visible and much more. Everyone is invited to come out and view the wonders of the night sky through the many wonderful telescopes available with the experts from the Foundation to guide you. If you have a telescope or binoculars, you may bring it and get help on using it to view the heavens. Refreshments will be served. Member benefits include: quarterly newsletter, yearly calendar, voting rights at MCOF general meeting, admission to 'Members Only' events and notification of all events. All donations of $50 or more will be memorialized on Founding Members' plaques to be displayed inside the Observatory. The next 'Members Only' night will be held Friday July 29, 2005 at 8:30 PM at the observatory. If you are not a member, you may obtain membership there for $20/individual or $35/family. Come out and enjoy the dark skies of Morgan County while learning more about astronomy and the stars. Other upcoming events at the observatory include an Indoor Summer Star Show at the Ice House Saturday (Date to be announced) (topic to be announced) and a Public Star Party Aug. 5, 2005 at 8:30PM. To get to Greenwood from Berkeley Springs, follow Rt 522 South 2 miles and take a left on Winchester Grade Rd (Rt 13), then travel 9 miles and park at the school on the left. For information 304-258-1013, http://www.nitesky.org, or dynsol@crosslink.net. MCOF will hold a public Star Party Friday evening Aug. 5, 2005 at 8:30 PM on the observatory grounds at Greenwood School. The planet Jupiter will be visible and much more. Everyone is invited to come out and view the wonders of the night sky through the many wonderful telescopes available with the experts from the Foundation to guide you. If you have a telescope or binoculars, you may bring it and get help on using it to view the heavens. Refreshments will be served. 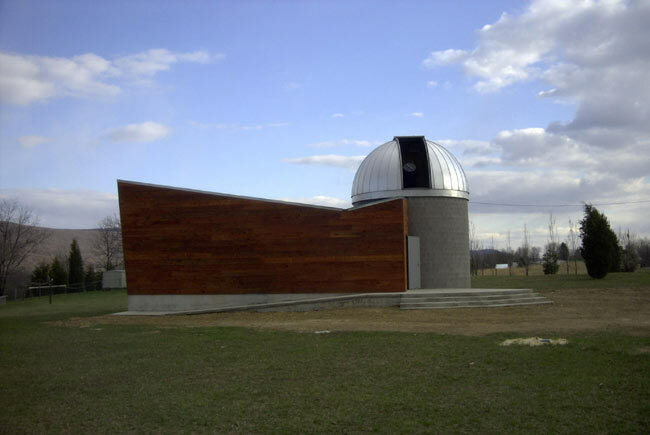 MCOF will hold a public Star Party Friday evening July 8, 2005 at 8:30 PM on the observatory grounds at Greenwood School. The planet Jupiter will be visible and much more. Everyone is invited to come out and view the wonders of the night sky through the many wonderful telescopes available with the experts from the Foundation to guide you. If you have a telescope or binoculars, you may bring it and get help on using it to view the heavens. Refreshments will be served. Member benefits include: quarterly newsletter, yearly calendar, voting rights at MCOF general meeting, admission to 'Members Only' events and notification of all events. All donations of $50 or more will be memorialized on Founding Members' plaques to be displayed inside the Observatory. The next 'Members Only' night will be held Friday July 1, 2005 at 8:30 PM at the observatory. If you are not a member, you may obtain membership there for $20/individual or $35/family. Come out and enjoy the dark skies of Morgan County while learning more about astronomy and the stars. Other upcoming events at the observatory include an Indoor Summer Star Show at the Ice House Saturday (Date to be announced) (topic to be announced) and a Public Star Party July 8 at 8:30PM. To get to Greenwood from Berkeley Springs, follow Rt 522 South 2 miles and take a left on Winchester Grade Rd (Rt 13), then travel 9 miles and park at the school on the left. For information 304-258-1013, http://www.nitesky.org, or dynsol@crosslink.net. MCOF will hold a public Star Party Friday evening June 10, 2005 at 8:30 PM on the observatory grounds at Greenwood School. The planet Jupiter will be visible and much more. Everyone is invited to come out and view the wonders of the night sky through the many wonderful telescopes available with the experts from the Foundation to guide you. If you have a telescope or binoculars, you may bring it and get help on using it to view the heavens. Refreshments will be served. Member benefits include: quarterly newsletter, yearly calendar, voting rights at MCOF general meeting, admission to 'Members Only' events and notification of all events. All donations of $50 or more will be memorialized on Founding Members' plaques to be displayed inside the Observatory. The next 'Members Only' night will be held Friday June 3, 2005 at 8:30 PM at the observatory. If you are not a member, you may obtain membership there for $20/individual or $35/family. Come out and enjoy the dark skies of Morgan County while learning more about astronomy and the stars. Other upcoming events at the observatory include an Indoor Summer Star Show at the Ice House Saturday (Date to be announced) (topic to be announced) and a Public Star Party June 10 at 8:30PM. To get to Greenwood from Berkeley Springs, follow Rt 522 South 2 miles and take a left on Winchester Grade Rd (Rt 13), then travel 9 miles and park at the school on the left. For information 304-258-1013, http://www.nitesky.org, or dynsol@crosslink.net. MCOF will hold a public Star Party Friday evening May 13, 2005 at 8:00 PM on the observatory grounds at Greenwood School. The planet Jupiter will be visible and much more. Everyone is invited to come out and view the wonders of the night sky through the many wonderful telescopes available with the experts from the Foundation to guide you. If you have a telescope or binoculars, you may bring it and get help on using it to view the heavens. Refreshments will be served. Member benefits include: quarterly newsletter, yearly calendar, voting rights at MCOF general meeting, admission to 'Members Only' events and notification of all events. All donations of $50 or more will be memorialized on Founding Members' plaques to be displayed inside the Observatory. The next 'Members Only' night will be held Friday May 6, 2005 at 8:00 PM at the observatory. If you are not a member, you may obtain membership there for $20/individual or $35/family. Come out and enjoy the dark skies of Morgan County while learning more about astronomy and the stars. Other upcoming events at the observatory include an Indoor Summer Star Show at the Ice House Saturday (Date to be announced) (topic to be announced) and a Public Star Party May 13 at 8:00PM. To get to Greenwood from Berkeley Springs, follow Rt 522 South 2 miles and take a left on Winchester Grade Rd (Rt 13), then travel 9 miles and park at the school on the left. For information 304-258-1013, http://www.nitesky.org, or dynsol@crosslink.net. The MCOF Public Star Party will be held on Friday April 22 and Saturday April 23, 2005 at 8:00 pm. at the Morgan County Observatory. There will be stargazing, refreshments, movies and hands on astronomy exhibits to entertain folks of all ages. MCOF will hold a public Star Party Friday evening April 8, 2005 at 7:30 PM on the observatory grounds at Greenwood School. The planet Saturn and Jupiter will be visible and much more. Everyone is invited to come out and view the wonders of the night sky through the many wonderful telescopes available with the experts from the Foundation to guide you. If you have a telescope, you may bring it and get help on using it to view the heavens. Refreshments will be served.. Member benefits include: quarterly newsletter, yearly calendar, voting rights at MCOF general meeting, admission to 'Members Only' events and notification of all events. All donations of $50 or more will be memorialized on Founding Members' plaques to be displayed inside the Observatory. The next 'Members Only' night will be held Friday April 1, 2005 at 7:30 PM at the observatory. If you are not a member, you may obtain membership there for $20/individual or $35/family. Come out and enjoy the dark skies of Morgan County while learning more about astronomy and the stars. Other upcoming events at the observatory include an Indoor Winter Star Show at the Ice House Saturday (Date to be announced) (topic to be announced) and a Public Star Party April 8th at 7:30PM. To get to Greenwood from Berkeley Springs, follow Rt 522 South 2 miles and take a left on Winchester Grade Rd (Rt 13), then travel 9 miles and park at the school on the left. For information 304-258-1013, http://www.nitesky.org, or dynsol@crosslink.net. 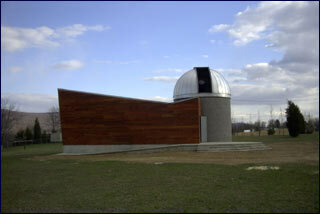 MCOF will hold a public Star Party Friday evening March 11th at 7:30 PM on the observatory grounds at Greenwood School. The planet Saturn will be visible along with the Orion nebula, Andromeda galaxy, and much more. Everyone is invited to come out and view the wonders of the night sky through the many wonderful telescopes available with the experts from the Foundation to guide you. If you have a telescope, you may bring it and get help on using it to view the heavens. Refreshments will be served.. Member benefits include: quarterly newsletter, yearly calendar, voting rights at MCOF general meeting, admission to 'Members Only' events and notification of all events. All donations of $50 or more will be memorialized on Founding Members' plaques to be displayed inside the Observatory. The next 'Members Only' night will be held Friday January 7th 7:00PM at the observatory. If you are not a member, you may obtain membership there for $20/individual or $35/family. Come out and enjoy the dark skies of Morgan County while learning more about astronomy and the stars. Other upcoming events at the observatory include an Indoor Winter Star Show at the Ice House Saturday (Date to be announced) (topic to be announced) and a Public Star Party March 11th 7:30PM. To get to Greenwood from Berkeley Springs, follow Rt 522 South 2 miles and take a left on Winchester Grade Rd (Rt 13), then travel 9 miles and park at the school on the left. For information 304-258-1013, http://www.nitesky.org, or dynsol@crosslink.net. POSTPONED! February 12, 2005 - Saturday Winter Star Show at Ice House 7PM POSTPONED! RESCHEDULED - MCOF Board Meeting: Saturday, Feb. 26, 10:00 AM Berkeley Springs Library, Berkeley Springs, WV. The MCOF Public Star Party will be held on Friday February 11, 2005 at 7:00 pm. The rain date will be Saturday February 12, 2005 at 7:00 PM at Morgan County Observatory. There will be stargazing, refreshments, movies and hands on astronomy exhibits to entertain folks of all ages. MCOF will hold a public Star Party Friday evening February 11th at 7:00PM on the observatory grounds at Greenwood School. The planet Saturn will be visible along with the Orion nebula, Andromeda galaxy, and much more. Everyone is invited to come out and view the wonders of the night sky through the many wonderful telescopes available with the experts from the Foundation to guide you. If you have a telescope, you may bring it and get help on using it to view the heavens. Refreshments will be served..
Come out and enjoy the dark skies of Morgan County while learning more about astronomy and the stars. Other upcoming events at the observatory include an Indoor Winter Star Show at the Ice House Saturday (Date to be announced) (topic to be announced) and a Public Star Party February 11th 7:00PM. To get to Greenwood from Berkeley Springs, follow Rt 522 South 2 miles and take a left on Winchester Grade Rd (Rt 13), then travel 9 miles and park at the school on the left. For information 304-258-1013, http://www.nitesky.org, or dynsol@crosslink.net. MCOF will hold a public Star Party Friday evening January 14th at 7:00PM on the observatory grounds at Greenwood School. The planet Saturn will be visible along with the Orion nebula, Andromeda galaxy, and much more. Everyone is invited to come out and view the wonders of the night sky through the many wonderful telescopes available with the experts from the Foundation to guide you. If you have a telescope, you may bring it and get help on using it to view the heavens. Refreshments will be served.. This Friday evening January 14th beginning at 7PM Morgan County Observatory will host a Public Star Party. The rain date will be the following evening Saturday January 15th , also at 7PM. There will be stargazing, refreshments, movies and hands on astronomy exhibits to entertain folks of all ages. Winter skies bring into view Saturn, the Orion nebula, Andromeda galaxy and many other celestial wonders. Everyone is invited to come out and view the wonders of the night sky through the many wonderful telescopes available with the experts from the Foundation to guide you. If you have a telescope, you may bring it and get help on using it to view the heavens. Come out and see the progress on the Morgan County Observatory and get a peek through the powerful 16" Cassegrain telescope housed there. Admission is free to all and donations are encouraged. The Board of Directors of the Foundation have elected officers for the next year with Loretta Brown as Secretary, Alan Moeck as Vice President, Barbara Campbell as Treasurer and Kevin Boles continuing as President. Volunteers of all ages are needed to help out at star parties and with other activities of the foundation, so please contact us if you would like to help. The Foundation would like to thank the following new or returning members and contributors for their generous support: Adam Schran of Ascentive, John Geist, David & Mary Hansen, Morgan County CEO's, United Way of Berkeley & Morgan County, Bill Lands, and Berkeley Springs Moose Club. Member benefits include: newsletter, yearly calendar, voting rights at MCOF general meeting, admission to 'Members Only' events and notification of all events. All donations of $50 or more will be memorialized on Founding Members' plaques to be displayed inside the Observatory. Come out and enjoy the dark skies of Morgan County while learning more about astronomy and the stars. To get to the Observatory from Berkeley Springs, follow Rt 522 South 2 miles and take a left on Winchester Grade Rd (Rt 13), then travel 9 miles just past Greenwood School on the left. For information 304-258-1013, http://www.nitesky.org, or dynsol@crosslink.net.